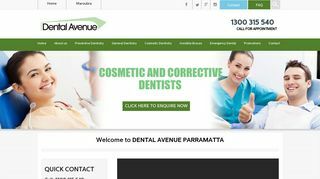 Parramatta Dental Avenue believes in offering its patients dental treatments while ensuring their comfort and safety. The dentist at Parramatta provide cutting edge results to patients through latest technologies. Dental clinics at Parramatta employ dentists who are qualified with years of relevant experience. These clinics offer preventive, sleep, cosmetic, emergency, and general dentistry. Besides these, you can avail the service of invisible braces as well.Here at Dental Avenue, we work hard with full dedication to help you achieve a healthier and brighter smile. Moreover, if you have damaged or missing teeth, feel free to call our experienced team for further information on your treatment options and to organise a consultation with one of our dentists.